The Lawrence Baroque Ensemble hosts “An Evening of Baroque Dance: Louis XIV Masque Ball” Friday, May 18 in the Warch Campus Center. Members of the Lawrence and Fox Valley communities are invited to participate as dancers or as spectators in an “interactive performance” designed to transport everyone back to the splendor of King Louis XIV’s Versailles. The evening begins at 6:30 p.m. with hor d’oeuvres followed by a formal masque ball at 7 p.m.
Lawrence President Jill Beck and Visiting Professor of Dance Rebecca Salzer will provide instruction in two large-group French Baroque dances. No dance or music experience is necessary to participate. Etiquette tips on how to show proper reverence in the presence of a king also will also offered. The evening will include a performance of a choreographed minuet and Lawrence music historian Sara Ceballos will provide historical context throughout the evening on the power of music at Louis’ court and the empowering effect of concealing one’s identity at a masquerade. The Lawrence Baroque Ensemble, along with members of the Lawrence trumpet and oboe studios, will provide music throughout the evening, creating an authentic grand ball atmosphere. Complimentary masks will be provided. The evening will culminate with the audience’s performance of the dances taught by Beck and Salzer. Space is limited and reservations are requested online. Complete and submit the RSVP form. (Clicking “attend” will not register you.) Formal attire is requested and low-heeled shoes are recommended. 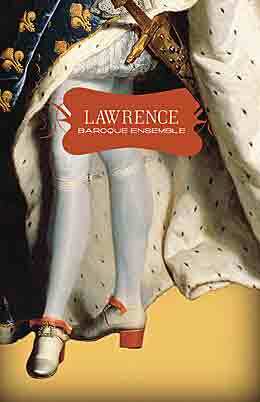 The Lawrence Baroque Ensemble was founded in 2010 by four students as part of the economics course “Entrepreneurship in the Arts & Society.” Its goal is to study, rehearse and perform baroque music that enriches students’ liberal arts experience, inspires passion for period-instrument performance, preserves tradition and celebrates individual creativity. Lawrence Baroque connects audiences to history through unique concert experiences.